Surprise! The Guy and I got married just a few days ago! 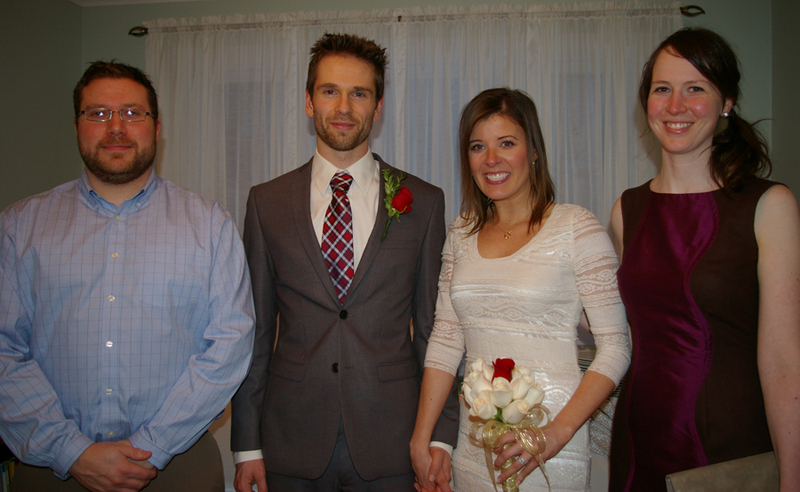 On December 30, 2013 we tied the knot and said our I Do’s. Not only that, The Guy my husband (!!) and I are moving from Ontario Canada, to California in the next couple of weeks. Just let that sink in for a moment before I carry on with the rest of my blog post. HOLY crap. Alright, so it all started in October/November when The Guy had a couple of interviews lined up with various companies in the bay area of California. We sat down and really discussed if this was something we really wanted to do. To make the big move. Otherwise he wouldn’t have gone down for his interviews. It seemed surreal, but I was still pretty stoked about the idea of moving there. I’ve been to California just once before in 2011 for a blogging conference, therefore I wasn’t going in completely blind. He got the job offer and we discussed it more with our parents and decided we had nothing to lose. We kept it hush-hush for about a week before Christmas. The day we were leaving to head home to Newfoundland, we put in our 60 day notice at our apartment. It all happened quickly so I didn’t know for too long, and I didn’t have to keep it a secret for an eternity. The Guy and I have been together 8.5 years, so a marriage was inevitable. We’ve talked about us getting married for a long time. My parents had The Guy over to the house for a chat about the big move and said that they’d like us to get married in Newfoundland because my Mom said she wasn’t missing another child get married. I just have 1 sibling, my brother got married in Ireland and we couldn’t go. 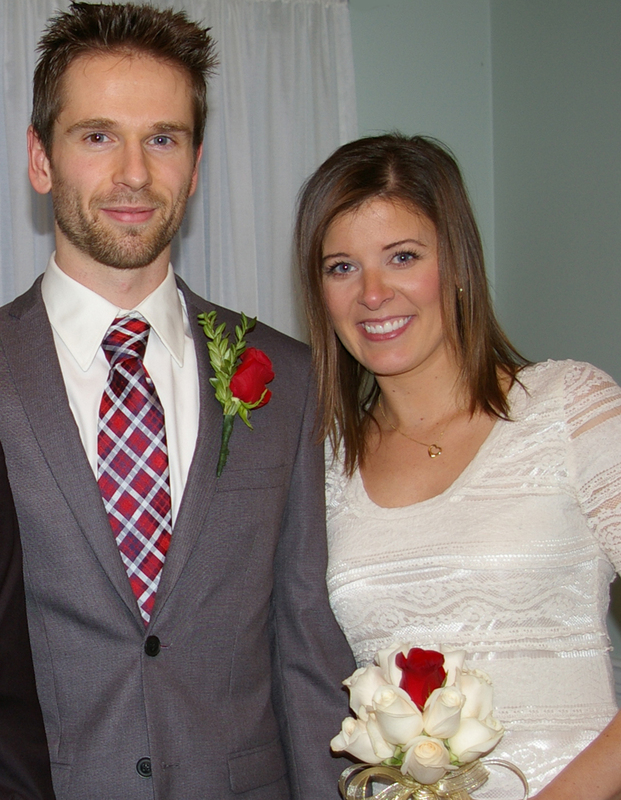 We knew we’d want to get married before the move, so instead of flying back again to Newfoundland in late January, we decided to put together the wedding the week that I was home. A wedding was planned in 6 days. 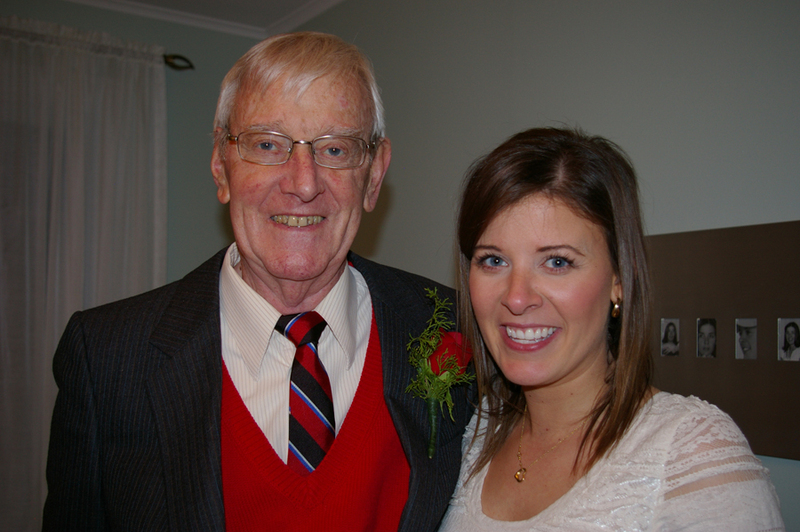 The incredible support system my parents have back in Newfoundland is just unbelievable. As soon as we picked up our marriage license on Christmas Eve, moments before the place closed, everything was go-go-go from there on. The wedding was very small with 22 people in attendance. The Guy‘s parents and 1 of his 2 sisters were there. In fact, she was flying out the day before and had to change her flight. 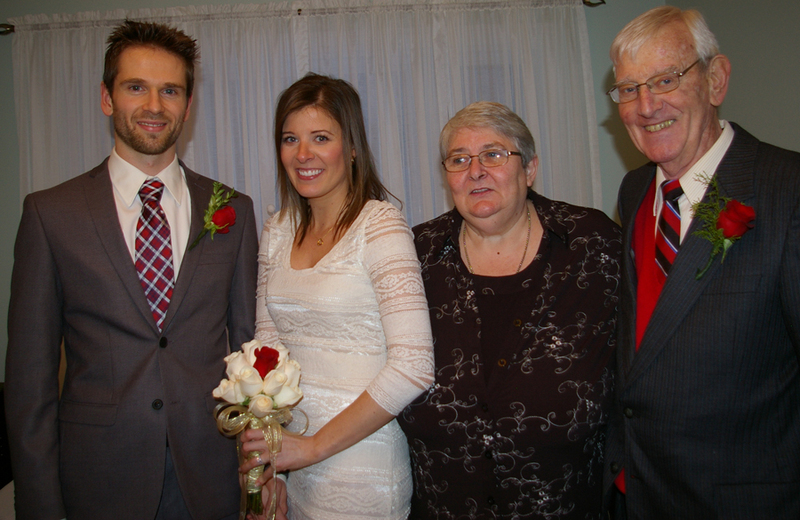 My parents, my brother and his family of 6 came, and the rest were family friends and neighbours who I’ve known my entire life. Good ol’ daddio and I. 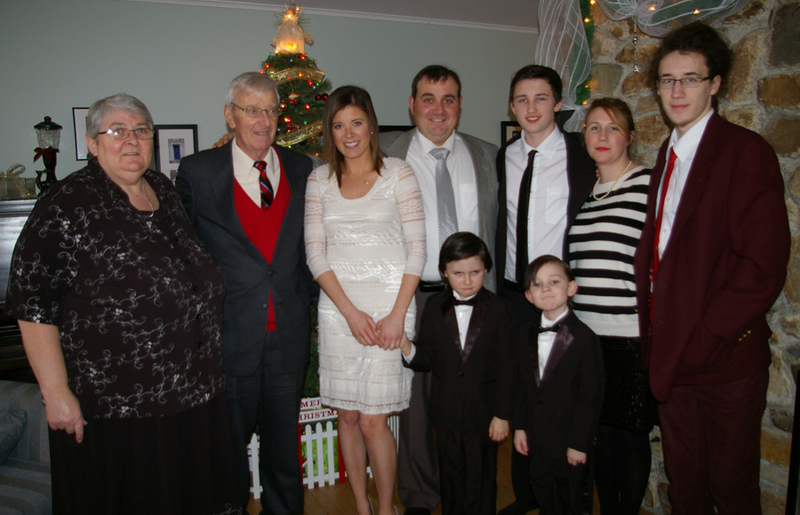 My parents, my brother and his family. I’m throwing in random photos because there are just so many to show you. 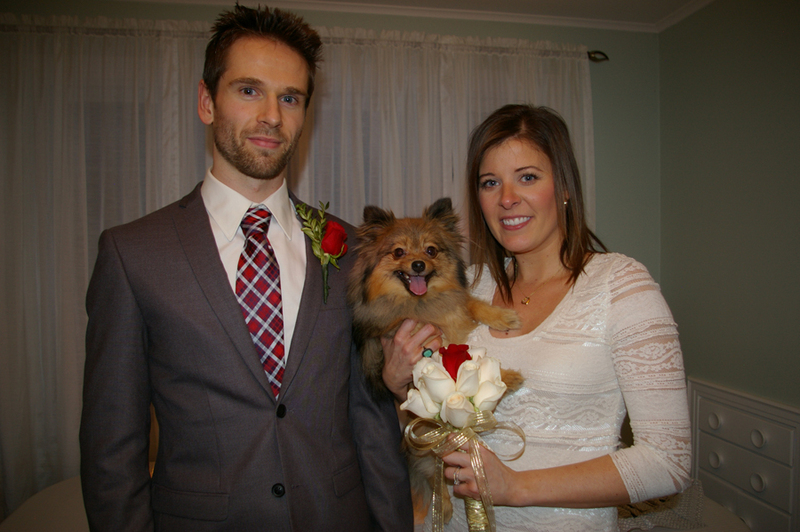 Here’s Alfie and I after the ceremony. The justice of the peace was also a long time family friend of ours who has known me since birth (photo of us three below). One funny thing about the whole ordeal was that I picked out the wedding rings and dress in four hours and still had time for a coffee with Mrs W., who came with me to pick everything out during the snowy cold day. And sweet mercy it snowed a lot this entire trip while we were trying to organize everything. 100cm (close to 40 inches) in the last 3 weeks of December, and more was coming. 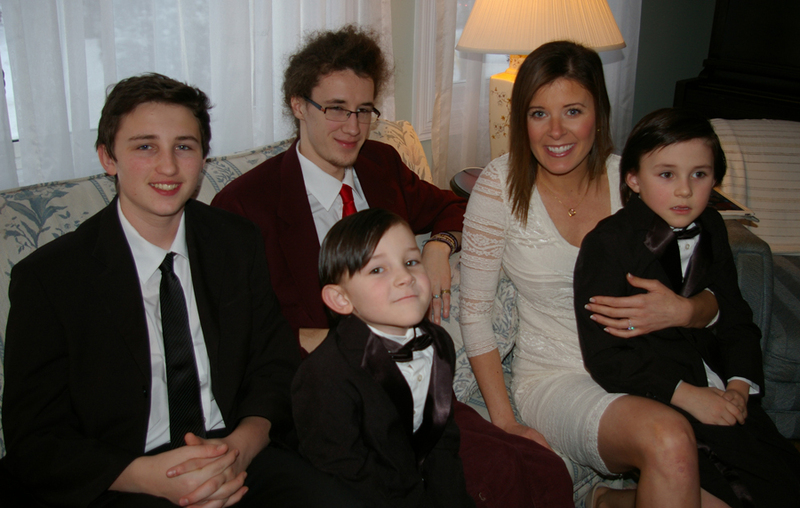 All my nephews and I pre-ceremony. It’s a good thing I packed my make up because at the last moment I threw it into my suitcase to bring home. I was thinking of giving my skin a break from wearing foundation. I brought just the basics. This “something old, something new, something borrowed, something blue” was much needed. Basically everything was borrowed. I even had to buy new underwear since I only brought brightly coloured under garments home with me. Can’t wear that under an ivory dress! I borrowed make up, jewellery, shoes and even the hair straightener from the W’s house too. I didn’t tell any of my friends I was getting married. 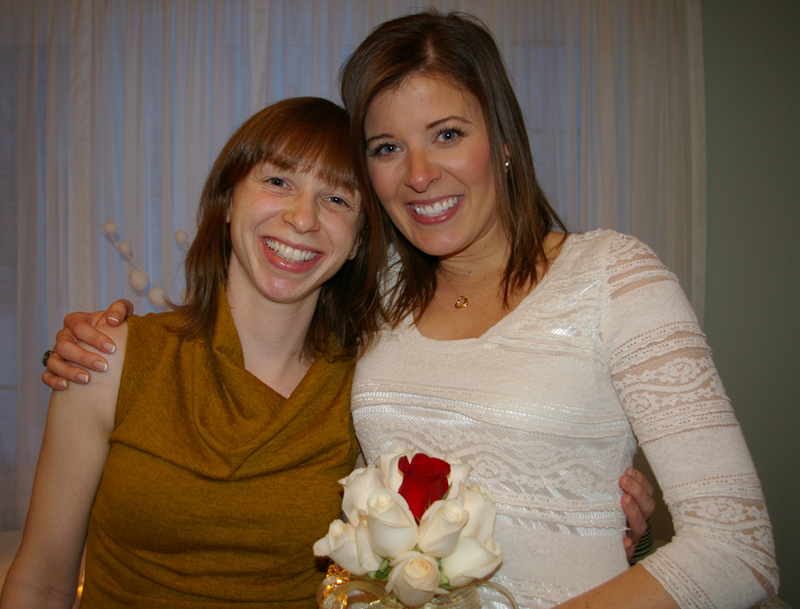 I called two of my best friends on the phone (both live out of province) and told them a few days before the wedding, and then the day before I texted a friend who is like a sister to me and asked her to come (photo below, with Lori). Of course, everyone was shocked since we skipped a step — the engagement. But the out-pour of congratulations, and support and how everything was pulled together in such a short amount of time just makes me speechless. In fact, I took a selfie of The Guy and I as we had a few moments to ourselves during the evening. I set it as my BBM picture on my blackberry. A few co-workers commented on it, asking why we were dressed up, if we were going out to dinner, or going to a New Years Eve fancy party. They didn’t find out until I came into work on January 2 and announced it. About an hour before the wedding started, I got dressed and had some photos taken with my family (The Guy wasn’t there yet, so he didn’t see me). Then about 3:30 I was shoo’ed into the hallway until it was go-time. This is where I had a drink with Mrs. W.
Even had time to tweet! I was surprised I wasn’t nervous. I thought I would be. 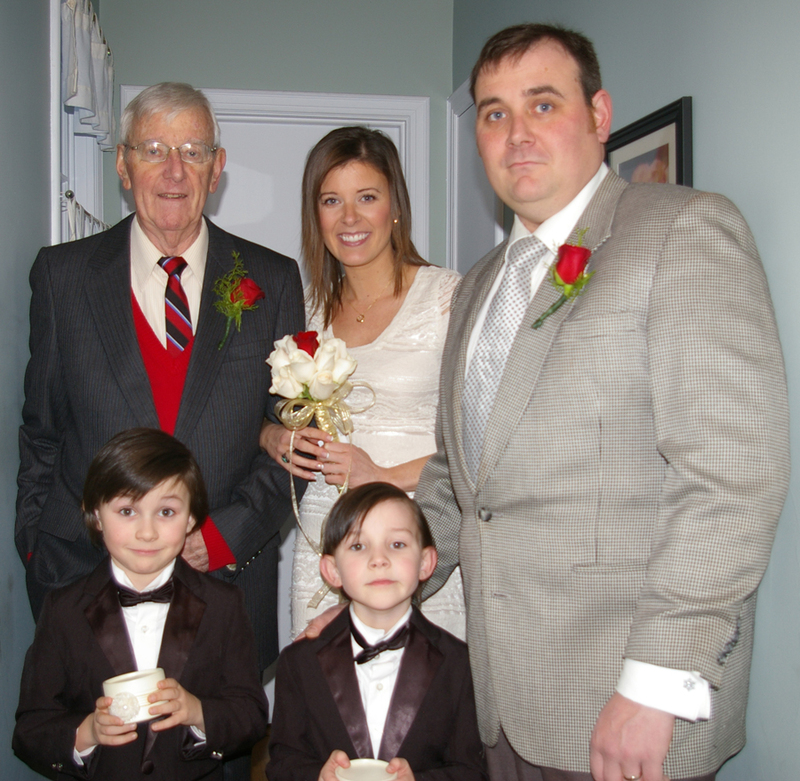 In the hallway I had my two nephews as my ring boys, my brother was my maid-of-honour (lol). 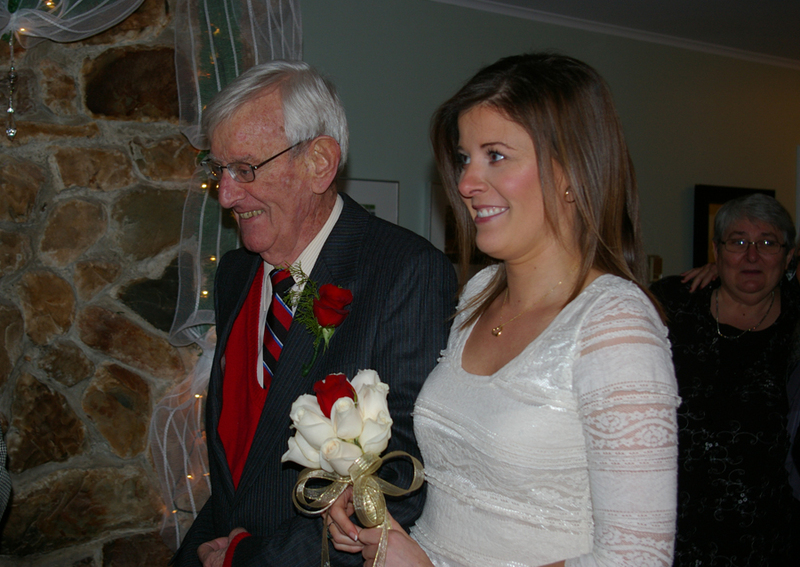 My Dad was feeling under the weather this Christmas so he put up a good front and walked me down the aisle in style. 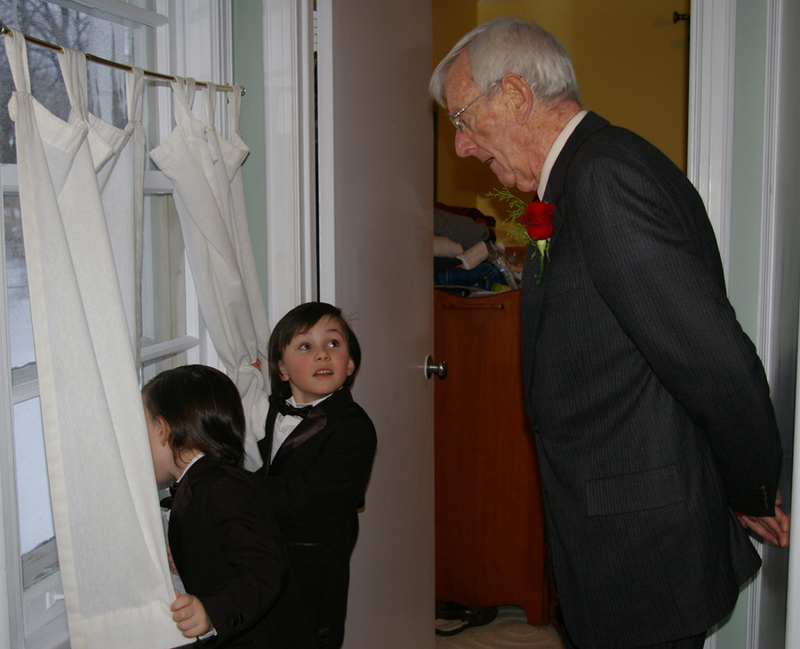 Dad and his grandsons. They’re looking outside at all of the white wine just chilling in the snowbanks. There wasn’t enough room in the fridge for it all! This is another great photo. Seconds before I walked down the aisle I wanted to rinse my mouth out with some scope. I think I told the boys to smell my fresh breath, the older one is running away and my Dad is in mid-laugh. It’s a great little candid! 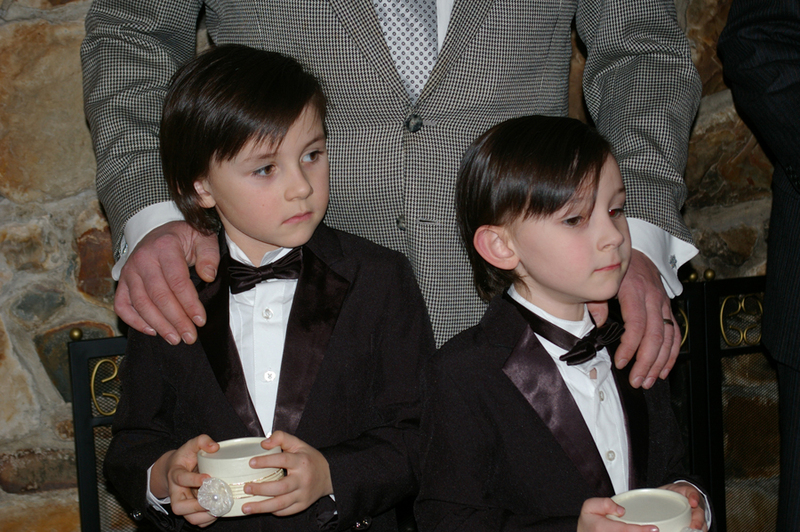 My nephews were adorable in their tuxes, holding onto the ring boxes like cutie patooties. When I got to The Guy, I started giggling quietly but sort of uncontrollably. 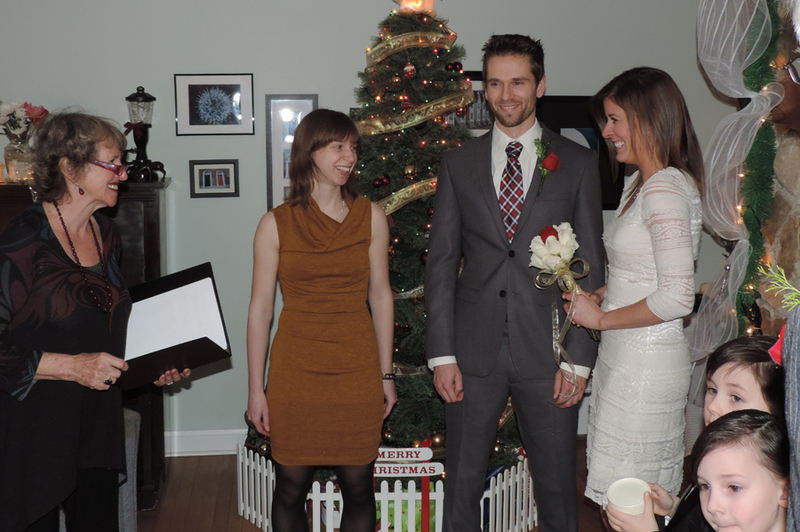 The ceremony itself was short and sweet, which is what I asked Andree (justice of the peace) to do for us. 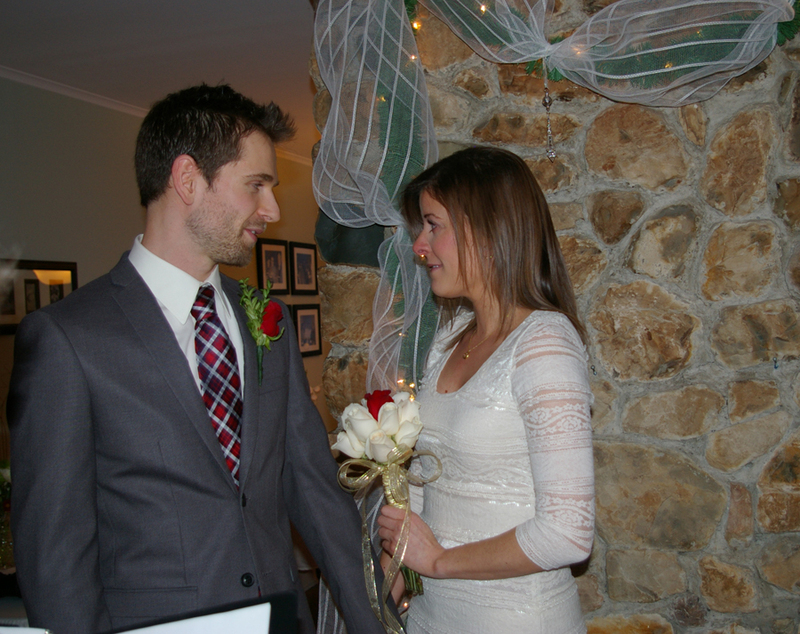 Once The Guy had to say part 1 of his vows, my waterworks started and my knees started shaking (noticeably). Candids are my fav. 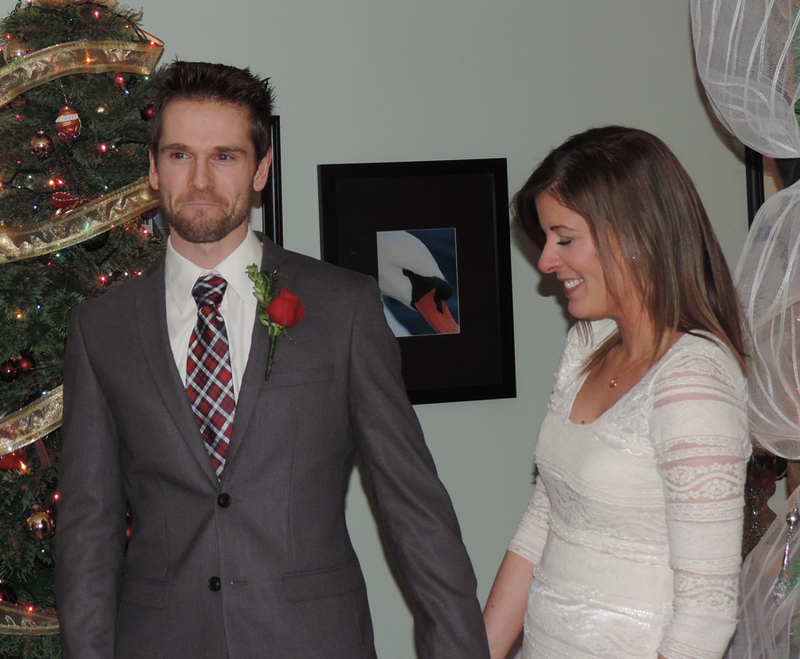 I think we’re giggling here, or just getting introduced after the ceremony as Mr & Mrs ____ ;) I have a new last name! Dude. Here is one of my favourite photos of our wedding day. I couldn’t look him in the eyes because I got too emotional. I was tearing up in this picture, he’s squeezing my hand, telling me it’s okay, that I was doing well and my mascara wasn’t running. HAHA! 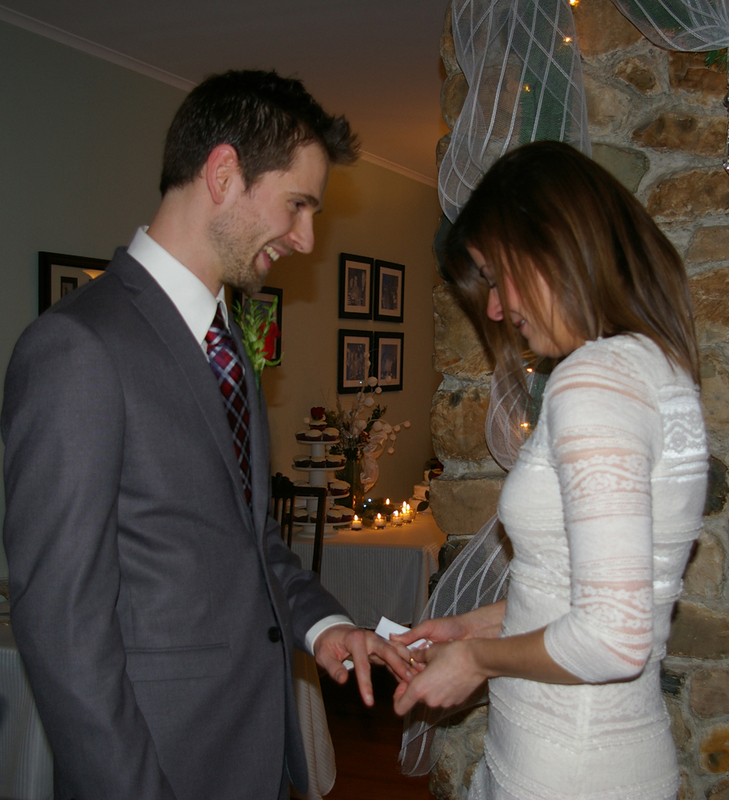 The exchanging of the rings was pretty amazing. Andree told us to say a few of our own words. The Guy said some sweet words which made me smile really big and made everyone “aww”, and I had a little note with me in case I blanked for what I wanted to say. I don’t really know where else to put a photo of my rings, so here you go. I already miss it, it’s out getting re-sized. 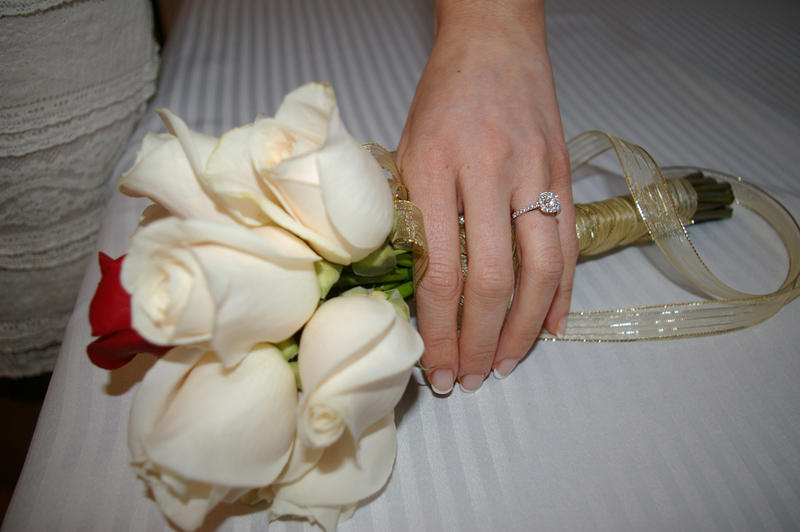 My bouquet and engagement ring. 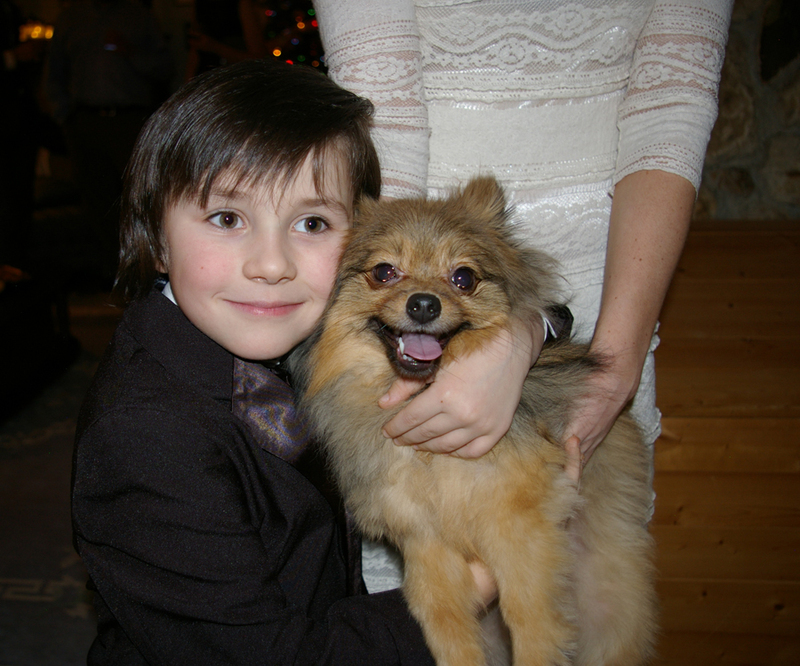 Alfie made an appearance too. 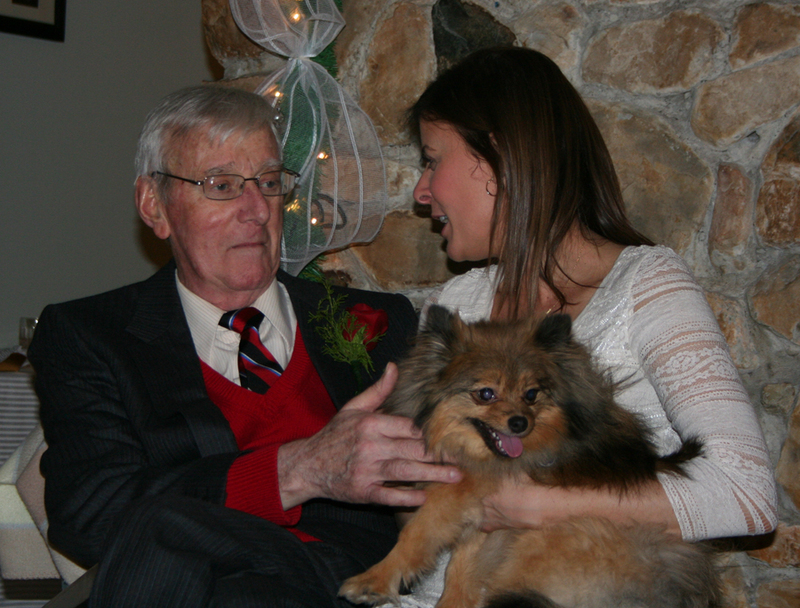 We put him downstairs in the basement for the ceremony, but we could hear him barking constantly, though out it. Oops. 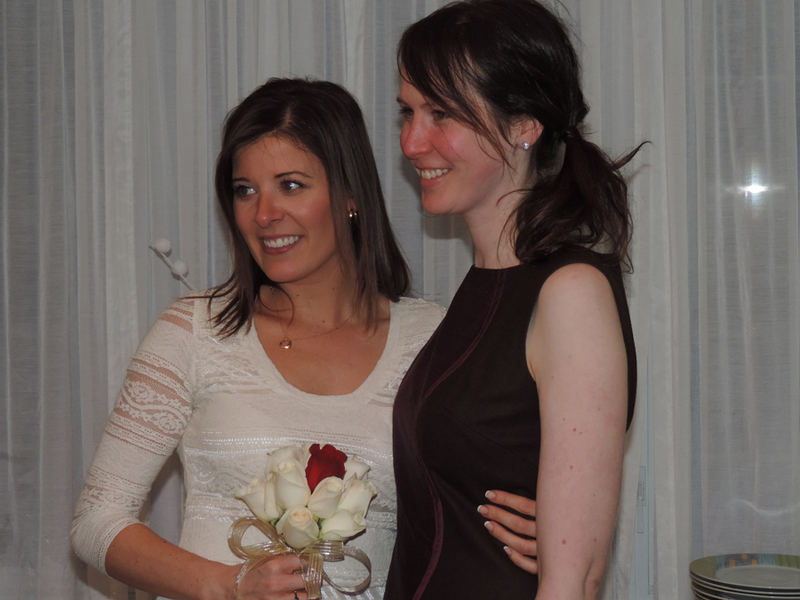 My fun loving Irish sister-in-law and me… the bride! HA, man that will never get old. A few of the neighbour “kids” came. 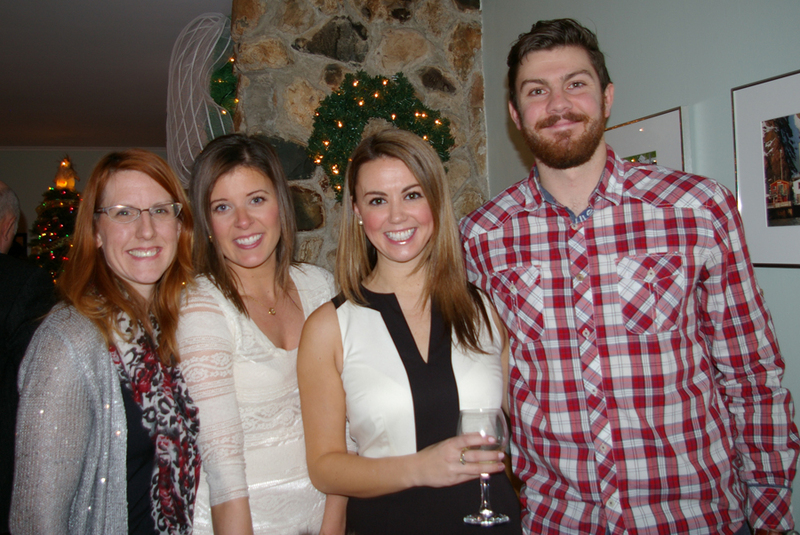 The one to the far left made all the flower arrangements, table decorations, my bouquet, and wedding decorations! 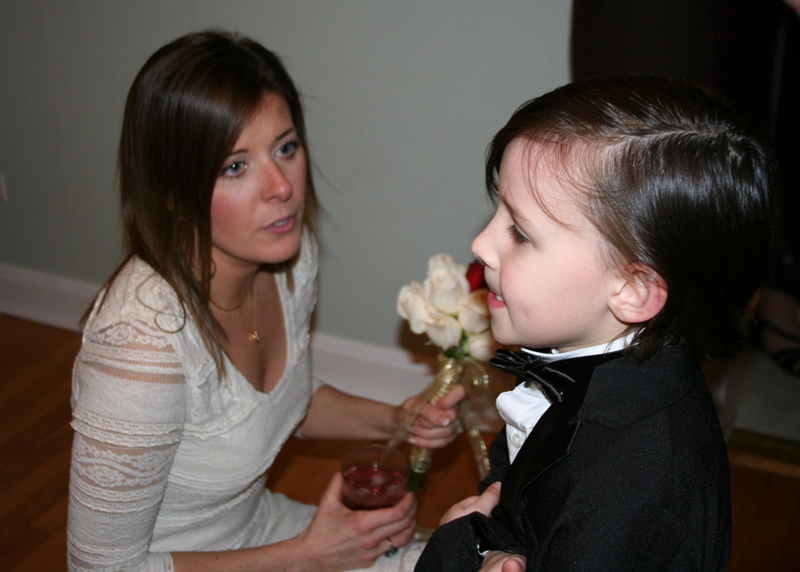 Chatting with my littlest nephew about the days event, wondering what he thought of it all. 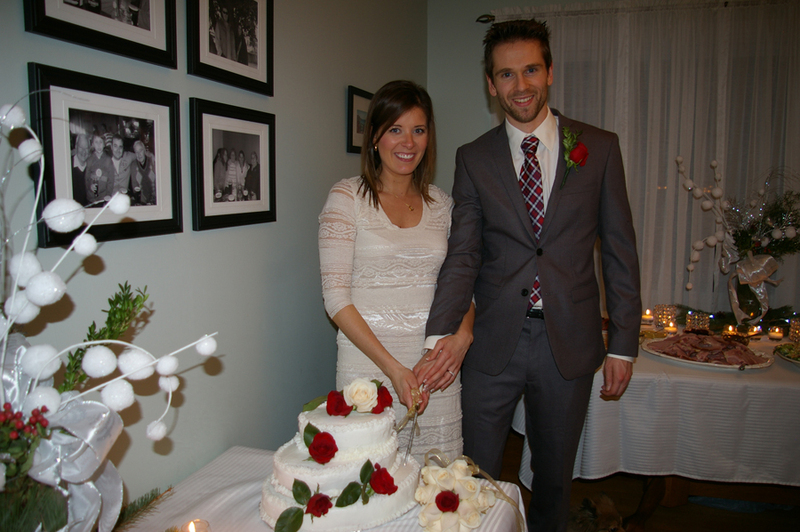 Our photographer was a family friend, she even made us a wedding cake! The Guy‘s Mom made some amazing red velvet cupcakes were quickly devoured by everyone. They were delicious. Food was prepped by all the neighbours and family friends. What a feed. I was starved by this point. Alfie was pretty tame with the large group of people. I was surprised my nephew could pick him up without Alfie growling. 4 years later, it’s a bit of progress. Both The Guy and I are from Newfoundland so when we fly home together we go our separate ways and stay at our parents’ place – which realistically is less than a 10 minute drive from one another. 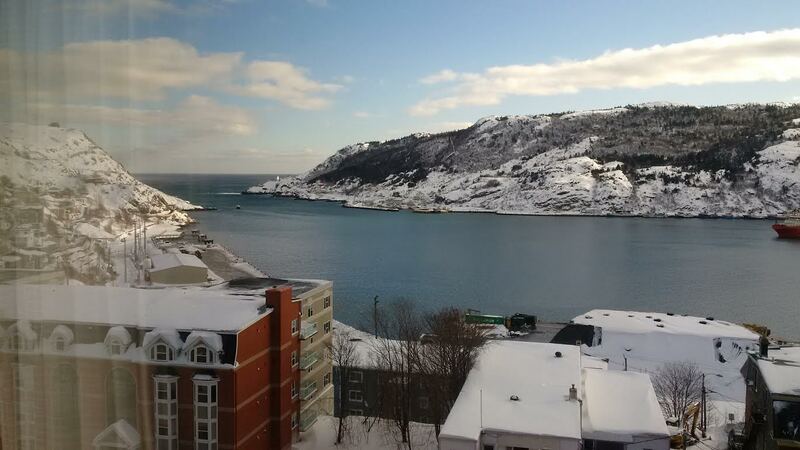 So on our wedding night, my parents got us a room together at the Sheridan Hotel where we had a beautiful view of the Harbour Front. Not only that, we were surprised with a generous gift basket full of goodies to gnaw on once we got to our room. 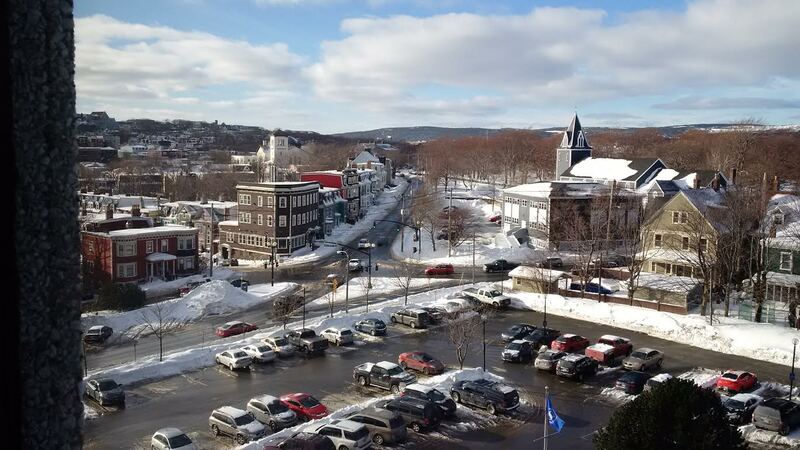 St. John’s from the 5th floor of the hotel. Here I was in my jeans getting ready to head out. The recap is a little late coming since we both kept most of it quiet until we both had a chance to tell our work all the news. The place where I work, has got to be one of the best family-orientated places to be. It truly is the happiest, most fun place I’ve worked and I will really miss everyone there. A few people even cried when I said I was leaving, and it was heart breaking to see that. But here’s to new adventures and new memories! Wedding fun facts. We didn’t have a wedding rehearsal before the actual wedding. I had to say “Pardon?” a few times during the repeat-after-me vows. My wedding dress was 50% off and cost me a total of $67. My french pedicure and french shellac manicure cost me double that. My Mom cut my hair the morning of the wedding because it was looking too stringy. 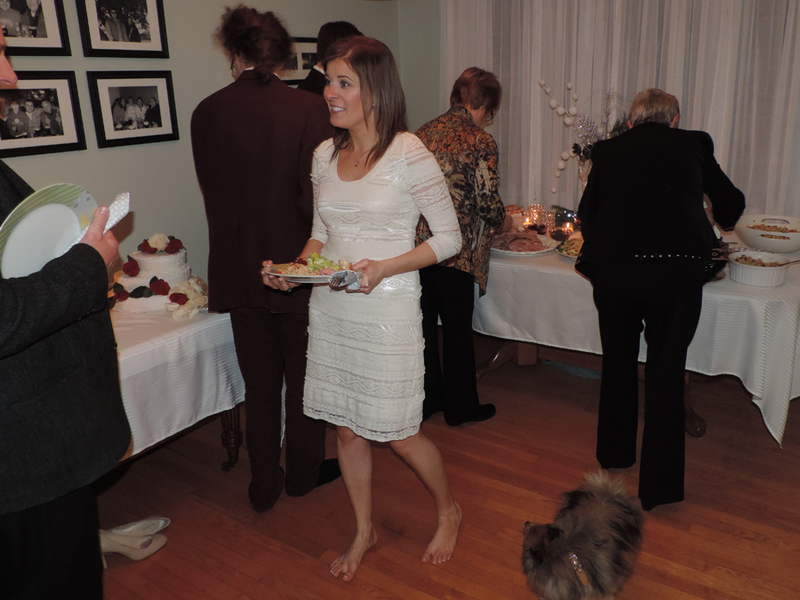 My wedding shoes were borrowed from my neighbours girlfriend (Hi Nicole!) – they were a bit too big so I stuffed toilet paper in the toe box!! Ring boxes were from the dollar store and I decorated it the morning of with a hot glue gun (that got all over my manicure) and some ribbon. Flowers were from costco. 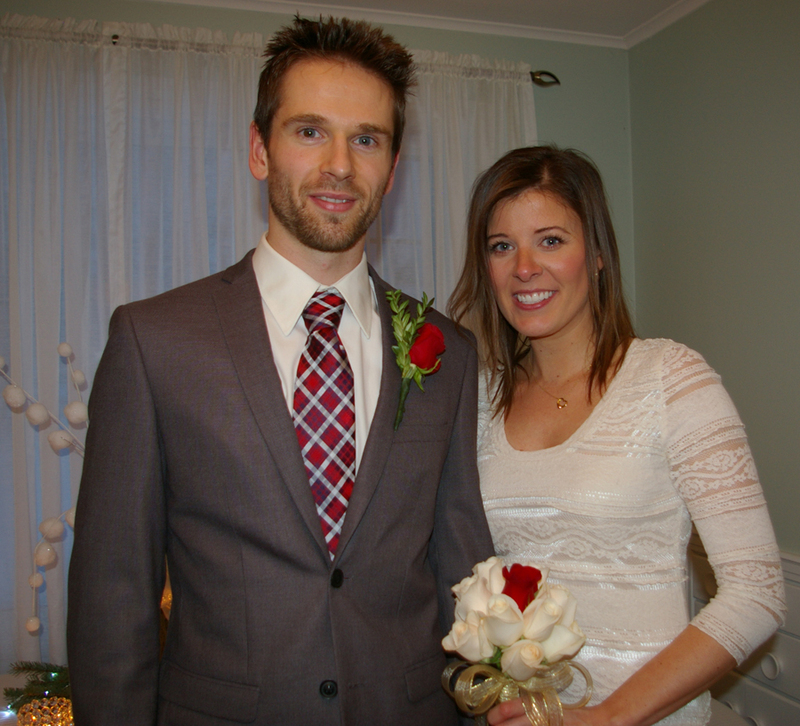 The bouquets and boutonnière were put together by another neighbour, who I cannot thank enough for decorating the entire house. The Guy‘s best friend chauffeured us around from my house, to Scott’s parents place (to say good bye to his sis as she was leaving to head back to BC the next morning) and then to our hotel. I had the hiccups pretty bad for about 45 minutes at the end of the night while we were hanging out at Scott’s parents. I’m sure this part doesn’t come as much of a shocker, we went to the McDonalds drive through, got some snacks and wouldn’t you know — McDonalds cured my wedding hiccups. Hilarious! Totally crying for your beautiful day! You sent out some funny stuff I was questioning, like a picture of your nails where you said maybe the colour looked bridal and I just kept thinking about it. CONGRATULATIONS! Everything was gorgeous and you look SO ecstatic! But California? So far…. so warm…. I’m so jealous…. Congratulations!! Sounds like a Fitfluential welcome party is in order when you guys get settled here in the Bay Area! Do you know where about you’ll be settling down? Sheena recently posted..How is it only Wednesday?! yay! finally! congrats once again. 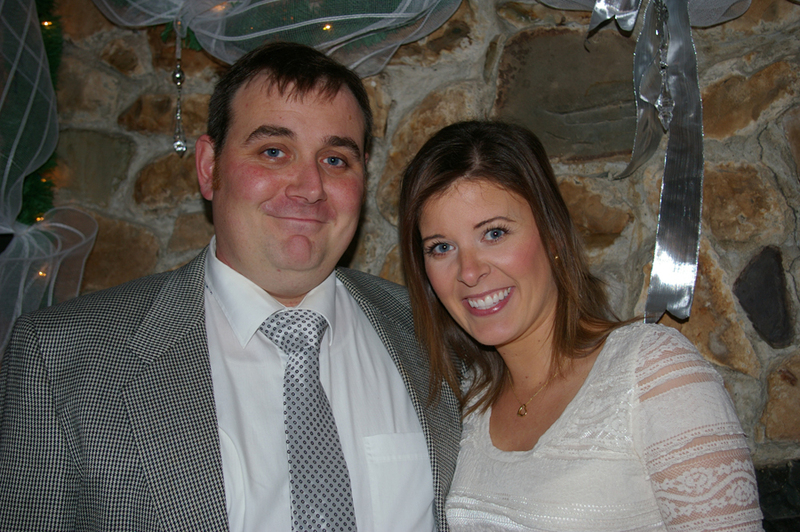 you looked so beautiful and Scott looked very handsome. Gorgeous ring! can’t wait to read all about the new adventure that awaits you in cali! GiGi Eats Celebritie recently posted..Yum… Oh Wait No, That’s Yucky! Love love love!! I love how relaxed, laid back, and heart-felt this is. It suits you to a tee! So happy for you both! What a lovely telling of your wedding day. Happiness is contagious, isn’t it? Nancy congratulations….What a beautiful post with beautiful pictures. Memories you will cherish always. I am in total awe of you for being able to whip up a wedding in that short amount of time but hey us east coast girls can do anything at the last minute right? You looked beautiful. Good luck on your move to CA..
Congratulations! A beautiful wedding, beautiful bride and a loving couple! :) The wedding sounds and looks absolutely wonderful from your blog and pictures. So excited for you and your husband and the new beginnings!! California??!! What an exciting adventure. 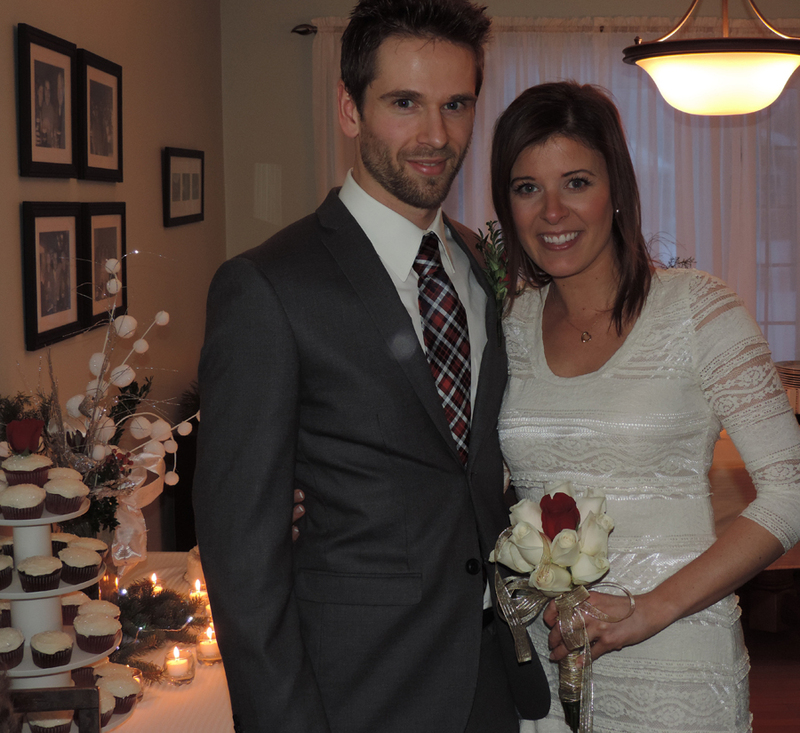 :) Congrats and love to you both. I loved every word of this. So happy for you both. I can’t wait to hear all about the adventures to come. Best of luck. This is by far my favorite blog!!! What an amazing day and even if we were not able to be there, we were all so excited for you in Ontario. 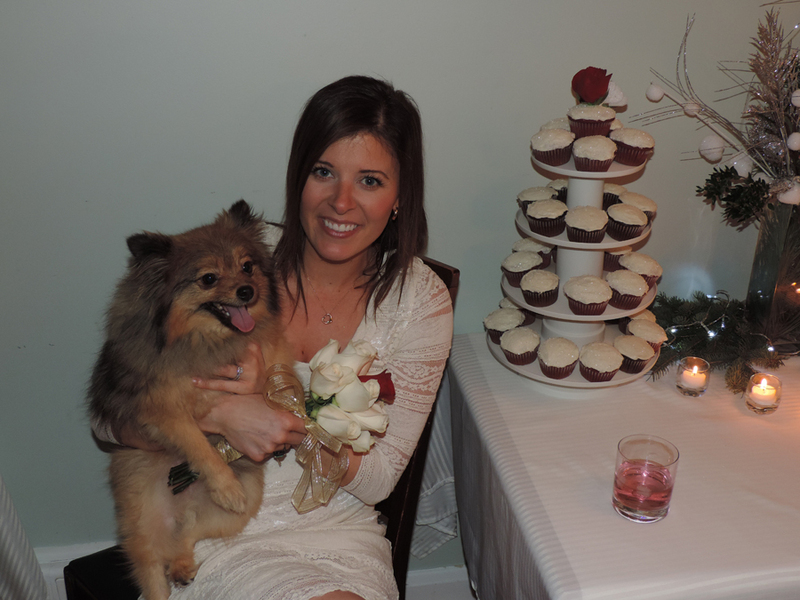 Everything looked perfect, from your dress to the smiles on Aunt Dean face to Alfie to attack dog. LoL we love you and congrats my beautiful little cuz. Who might I add is MaRRiED!!!! Nancy I am SOOOOO excited for you!! Congratulations! :) I love the way you guys did things. You focused on what really matters!!!! Nancy, I got all teary-eyed reading this! I had THE best time with you over those few days! From that frantic call the night before Christmas Eve, all the calls to try and keep you calm until you got that license….then looking for dresses on that snowy day …how lucky was it to find an ivory-colored dress, right after Christmas,that was just beautiful on you??! You were a beautiful bride! It was a beautiful wedding and I am so happy to have been part of it! 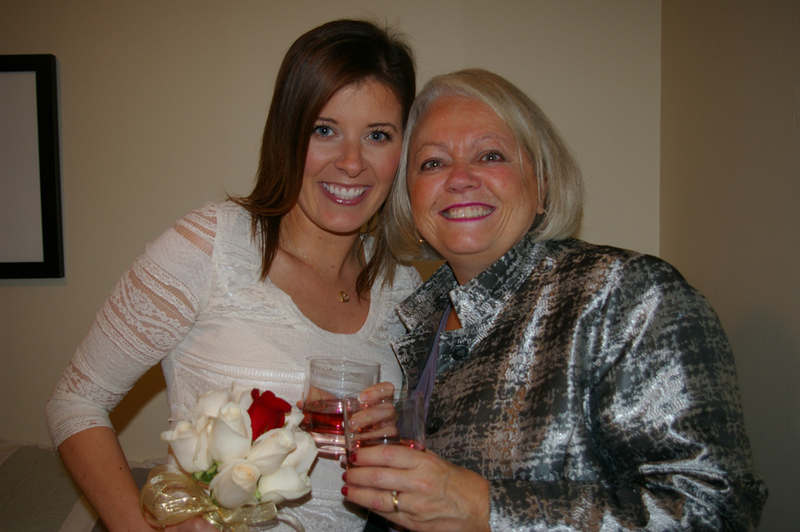 I can’t believe our “little ol’ Nanc” is married! I am so proud of you! Congratulations to you and Scott and I wish you a lifetime of happiness together! I just love this post! Congratulations! This was an amazing story to read, thank you for sharing! I can’t wait to hear about the move to California! CONGRATS!!! SO exciting!!! What a wonderful surprise. Congrats! 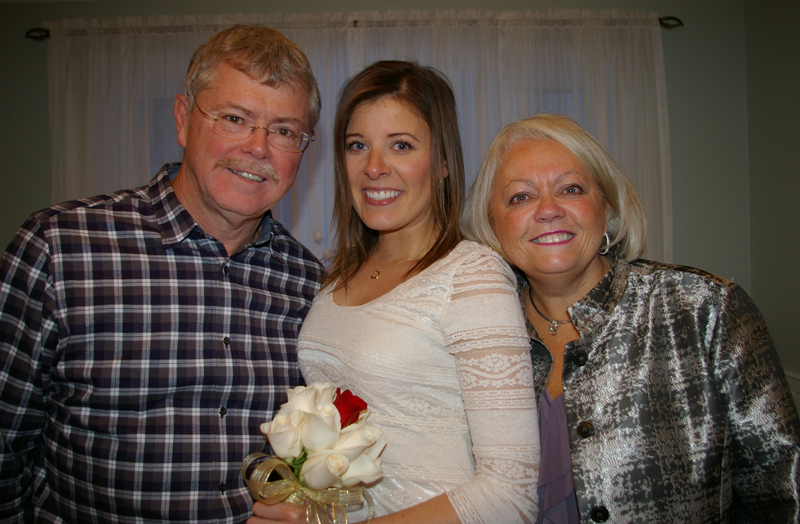 My dad has this theory that small weddings last and large party weddings do not. I suspect that my dad is right. I’m so happy for you & Scott! Janice recently posted..Win a GoodLife Fitness Membership and take the Your Better Starts Here Challenge! BEAUTIFUL. What a lovely couple. Congrats on your marriage and on pulling it on together. Triple congrats on the new move. FUN GIRL! Kyla@Mommy’s Weird recently posted..2013 Best Blog Posts…. Congratulations!! I love the simplicity and surprise of your wedding! I also really love that your bigger focus is the marriage, not the wedding. So many girls get married just to have a giant wedding, but then it’s a big letdown when the engagement stage is over. I love what you did! Best post ever!! I teared up reading this! I’m so happy for you, Nancy. :) good luck with your new adventures–can’t wait to read about them! Congratulations!!! Good luck with your move. 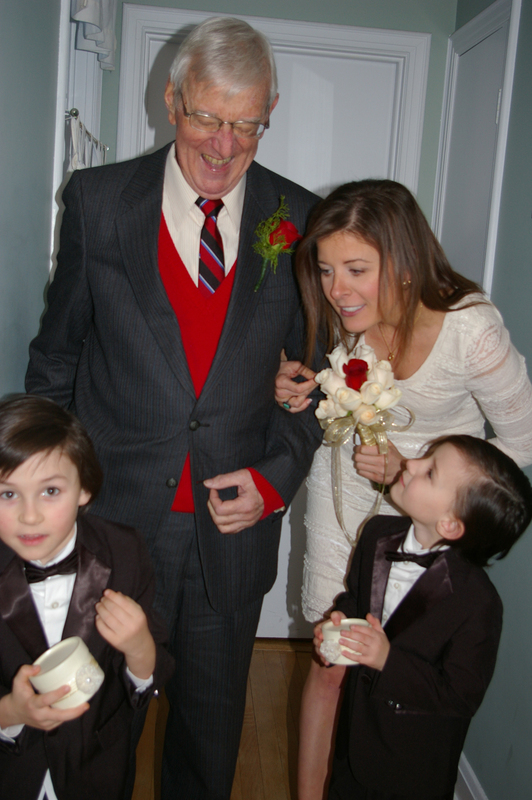 December 30th is a wonderful anniversary date – my husband and I were married on 12/30/95. I am so so happy for you and your new hubby! You both look stunning. Congratulations! I can’t believe you are moving though. Can’t wait to hear all about the new adventure! Wow! Congrats on such an incredible day and union between you guys! You look beautiful and the joy from the photos in your face and your writing is palpable. 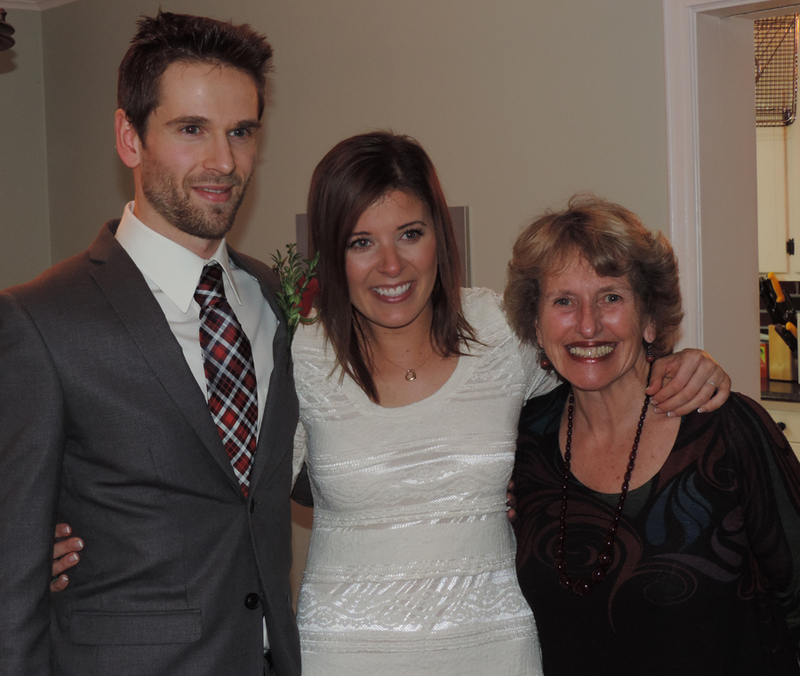 :) We’re switching places kind of – I’m a Californian in Canada (Calgary)…I hope you enjoy the new adventure ahead! Bonnie recently posted..Ripped: a product & a workout! Congratulations Nancy!!! I’m so thrilled for you!! Congratulations! When it is meant to be, it is easy and awesome! I can’t wait until you’re here ! I’m so happy for you and your new husband!! Good luck with your move to California! CONGRATULATIONS!! What a beautiful wedding, so nice and intimate and all done in 6 days. All the best with the move to sunny California. I’m so jealous. Congratulations!!!!! :-) You looked absolutely beautiful! Congratulations! Best of luck with all the new endeavors! Amazing! You both look gorgeous and it sounds like you had the perfect day. I couldn’t imagine a more intimate, perfect way to get married! Congrats! Awesome story! I am so happy for you Nancy! Believe me i loved reading about it. You guys, family and friends look so happy. Must have been such a great cerimony. The wedding ring is beautiful and you and Scott look absolutely perfect together in the pictures. You look so gorgeous in that dress and Scott was so handsome as well. What a great couple. Really liked how everything was setup so quickly and so down-to-earth. Honestly the way everything happened makes it even more beautiful and something to remember. Congratulations on your new life together and good luck on California! LOVED THIS RECAP! I am so happy for you! 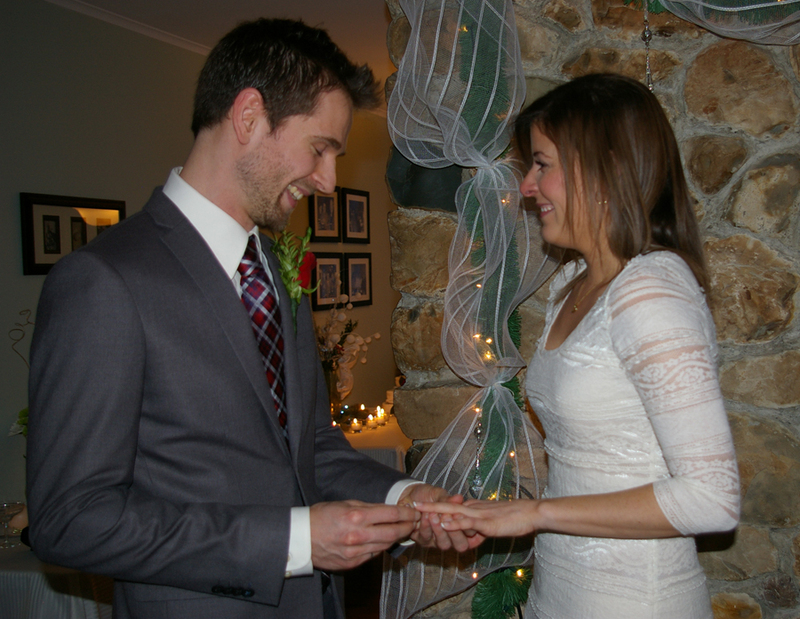 You looked absolutely stunning, and your rings are GORGEOUS! Such stunners. And I can’t believe you will be living in the U.S. now!!!!!! Congratulations. That’s so exciting! You looked absolutely lovely. Must have been such a wonderful day. Best of luck on your move – that’s quite the distance. What an exciting adventure! Congratulations! I love this because it’s simple and cost-effective, and quick! Where are you moving to in California? I am very happy for you nonetheless, the photos really convey everyone’s happiness! Mona (Moxie-Dude) recently posted..Sometime recipes come from unexpected places. Like this blog. Wow, how wonderful, and common sense! Simply made me smile. Congrats and here is to the big Cali move. I lived there twice, you will love it, except for missing home. Huge congrats! You are simply glowing. Last minute weddings are really the best. All the fun and none of the stress. Best wishes for your move and may you be blessed every day. Shash recently posted..It’s not how much we give but how much love we put into giving! This is wonderful! Congratulations! You are a gorgeous couple! Best of luck in Cali, what an adventure! Congrats -you both look fabulous. best of luck in Cali !! How tremendously exciting. Perfect and beautiful wedding day! So sweet the neighbours and family all got together to make all that food and cannot believe you planned this in so few days!! Incredible! 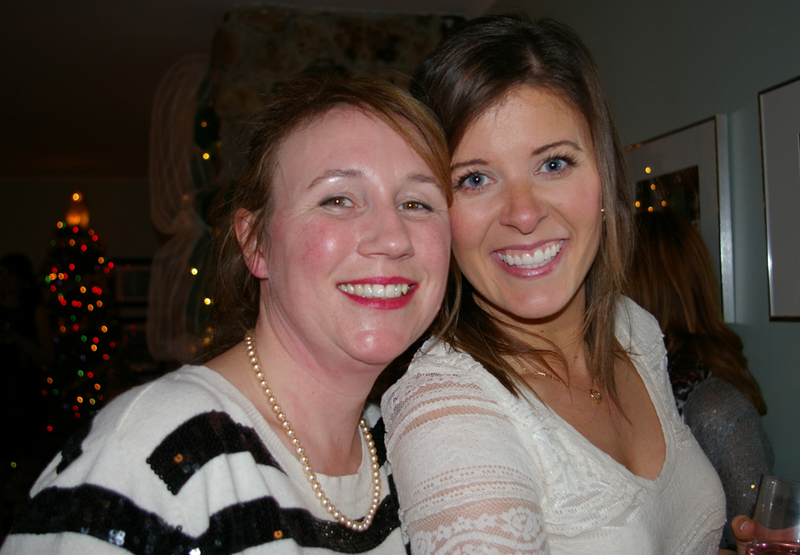 You looked beautiful–what a steal on your dress (vs mani/pedi, ack! :P) and Scott so handsome. Can’t believe you’re moving to California, wow! So exciting and awesome!!!! GOOD LUCK with the move, it will be here before you know it. Thanks for sharing photos and such a detailed description of the day–looks fabulous and a day you will remember forever. Congratulations Mrs!!!! Congratulations! I have no idea how I missed this! Perfect, amazing, hilarious wedding story! Congratulations! You looked absolutely gorgeous and so happy. Micaela recently posted..You might say we’re just a wee bit Canadian. I haven’t posted a comment before but I am a huge fan of your blog and it’s one of the only ones I read regularly. I just wanted to say congratulations on your wedding! You loved beautiful and your day sounds like one I’d love too. All the best for the future! Nancy, what a whirlwind! First I congratulate you on your marriage, it seems like you did it up right. The right people, the right time and the smiles truly say it all. What a wonderful way to start your next adventure together! I think you will LOVE living in California, just think of all the running you can do with no snow! We haven’t known each other long but I wish you and your husband all the best in your new life together! Incredible!!! Congratulations. 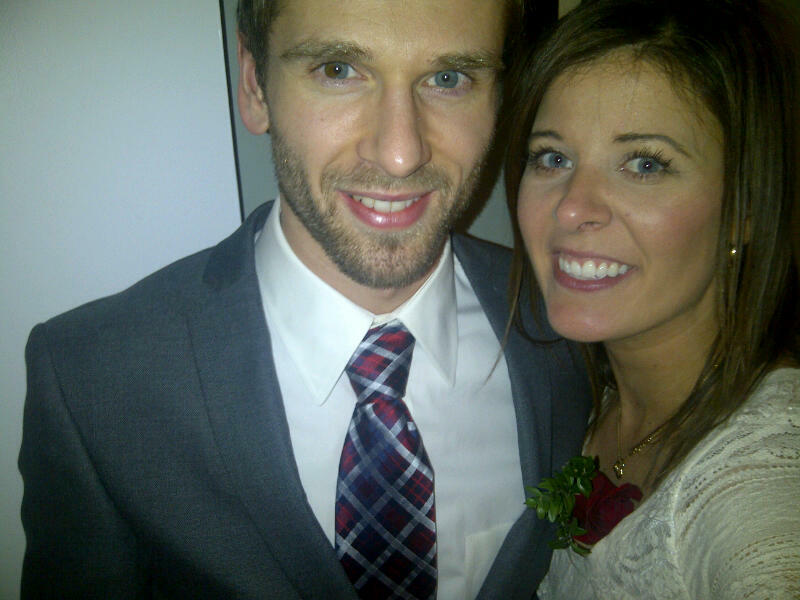 You look beautiful and your husband looks great and wow just wow that’s a fast wedding. @char eats greens: Hey Char, my neighbour and I went out to the mall and picked out a wedding ring set, while my family was planning the wedding. Then Scott & I went to buy it a few days before the wedding, and the day before our big day, he finally purposed, haha. Kinda backwards, but we’re not very traditional! aw this is so cutee! 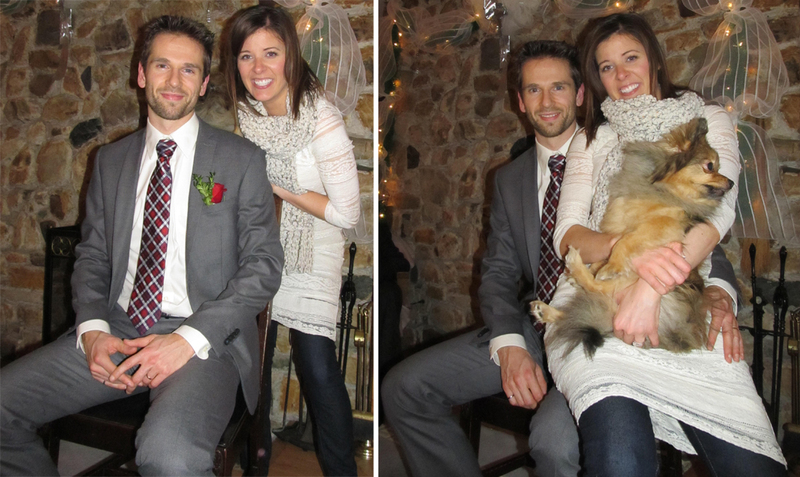 Congrats to the cutest couple :) Loved the pictures! Most people say you can’t have a successful wedding with only a week of planning. You proved this isn’t always true. Thanks for the write-up.